Autumn Leaves - More shells! 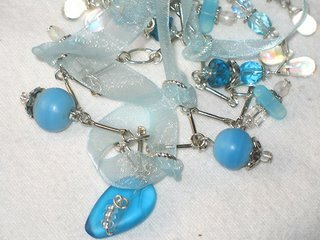 I love combining different materials and ribbon is the latest fashion trend in materials for jewellery right now. 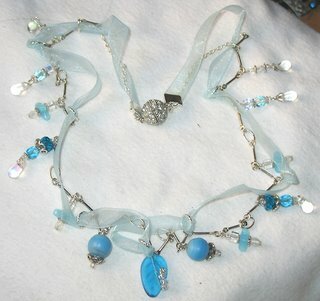 For the Breeze necklace below I used a love shell grey ribbon from Ribbon Oasis. The necklace is again a mix of old and new beads, semi-precious (jade in pale green and mid green), shell and my favourite Magatama drops. 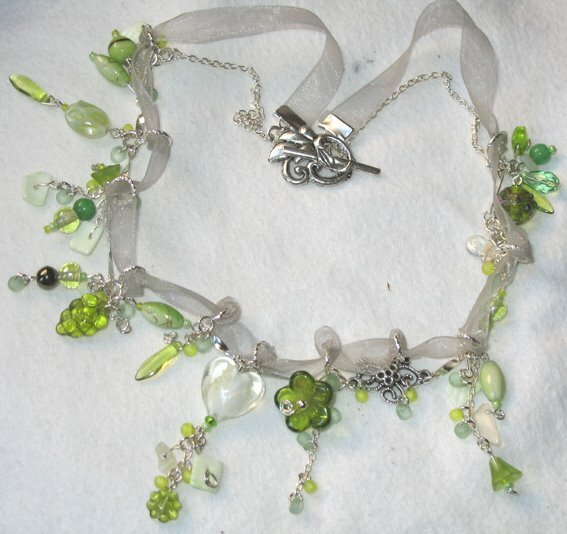 I've used lovely filigree flower connectors (again all the way from China) and more twisted and elongate bow shaped connectors, oval jumprings in two sizes and twisted jumprings to keep the ribbon in its place. All is finished off with a beautiful leaf toggle clasp. Celestial again uses a mix of old and new beads in different shades of blue and crystal beads held together by little conncectors, oval and twisted jumprings and the lovely pale blue ribbon. The finishing touch is a crystal ball screw clasp. Both necklaces are for sale. E-mail me if you are interested. Might have said it before, but I just managed to get hold of some really beautiful vintage beads, so I wanted to make something special. The curvy spacers came all the way from China and I've added large vintage jet and Aurora Borealis (AB) coated feature beads with oblong teal beads on either side and more vintage beads in purple and AB coated dark blue. Finally, I used a few new AB coated emerald and teal faceted beads. 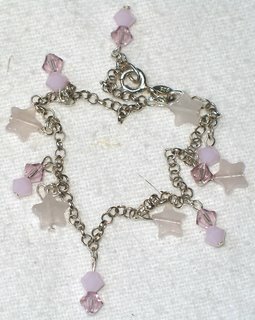 To add more interest and space the beads so the bracelet would have the exact length I required I used lovely teal silverlined seedbeads and a few tiny flower spacers. 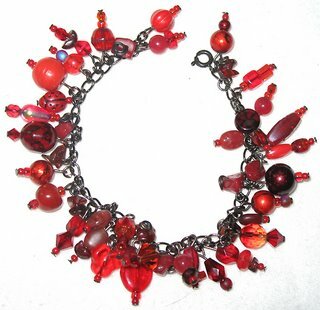 The bracelet is quite large and slips fairly easily over the hand. I am very pleased with the colour and the way it shimmers like a peacock's feathers. The Rasperry bracelet was only finished this afternoon. 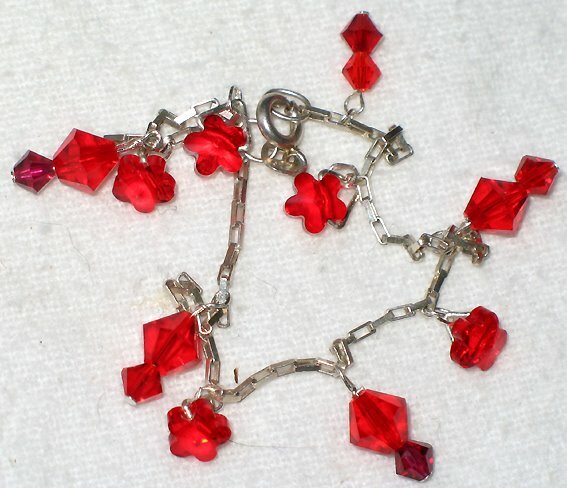 It is more delicate than the Peacock bracelet, and shimmers in all shades of reds and pink. Both bracelets are for sale. E-mail me if you are interested. 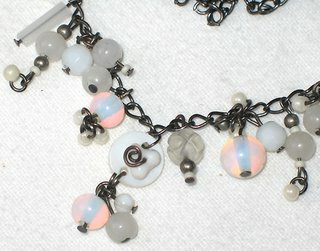 I've used vintage and new beads on blackplated chain, to go with the "moon" theme I added some moonstone or opaline beads. 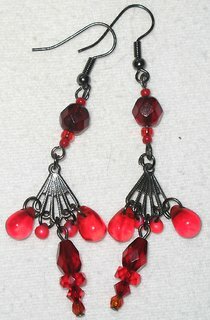 They are vintage Victorian and I think work really well with the rest of the beads. There is also white jade, some mother of pearl button and round beads, faceted Czech white beads, and a few little Magatamas in a pearly shade of cream, finally I've added a few Vintage beads in cream and white for more interest. Hot of the press - made this bracelet this afternoon. Had a lot of vintage beads arrive today and couldn't resist to make something lovely and special with them. I've used modern silverplated findings: the plain toggle clasp and beautiful diamonte spacers, a few silverplated beads and crimps and the clamps at the ends. All is held together by silver tigertail. The vintage beads are faceted AB coated crystal ovals and AB coated smooth round crystal beads in an alternating pattern. 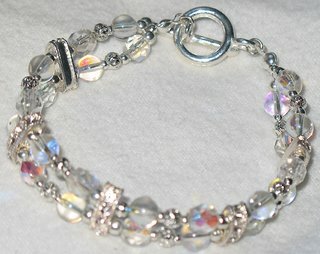 I love the way they reflect the light differently and give the bracelet a lovely depth and sparkle. The sun was shining on Saturday and the light was lovely and golden, so I fancied something that reminded me of the Summer that has almost passed and the Autumn that is not quite here yet. 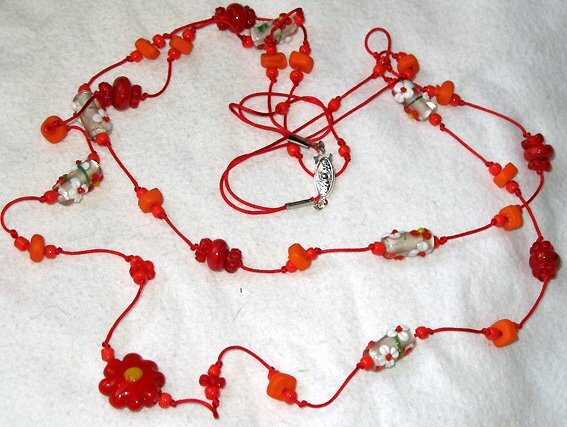 I decided to do a necklace strung and knotted on silk red cord with orange and red beads. Below is the result. 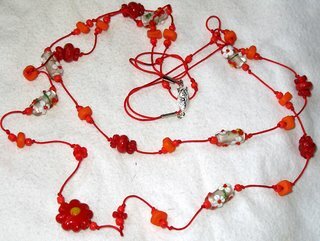 A two-tiered necklace with beads in reds, oranges and a red daisy and clear daisy feature beads. 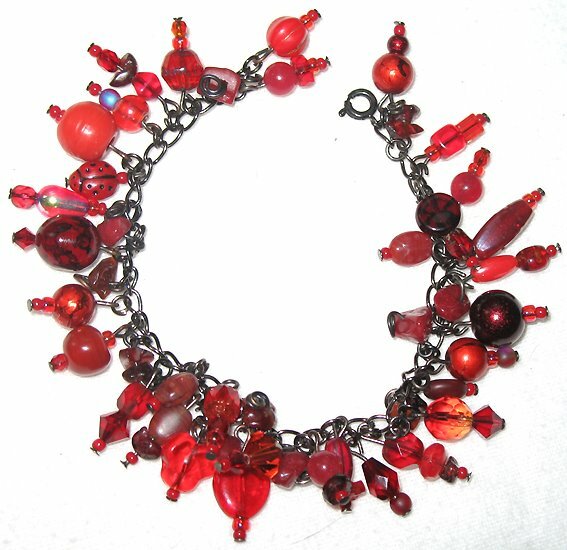 It would be difficult to find a bracelet to match the necklace, so I made one to go with it, using the same beads and oval jumprings. 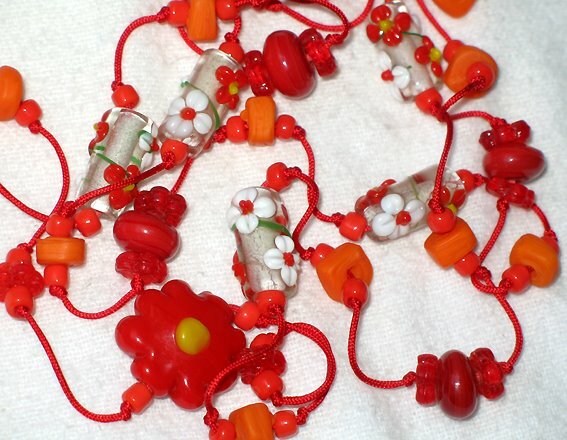 I recently found some lovely beads in a Chinese eBay shop. I bought green hearts and also the teal tear drops from the blue flapper necklace. 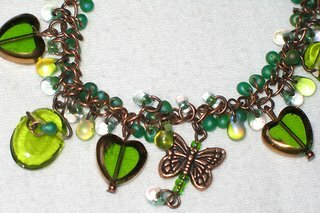 For this bracelet I used the green hearts , which are framed in copper - the perfect combination in my opinion. 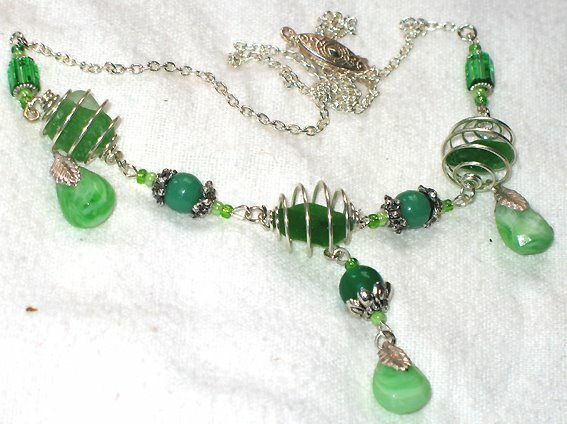 I've added green Harlekin drop beads, which had a little Magatama drop added to the finding for more interest. 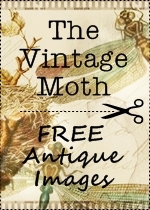 The centre piece is a lovely copper butterfly and to soften it I've used my favourite (!) Magatama drops in different shades of green. 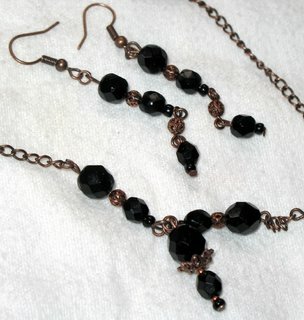 A little copper heart bead next to the clasp finishes it off. Like my other bracelets using Magatama drops this bracelet has a lovely soft and organic feel to it. Been playing with some sterling silver bracelets I bought a while ago. 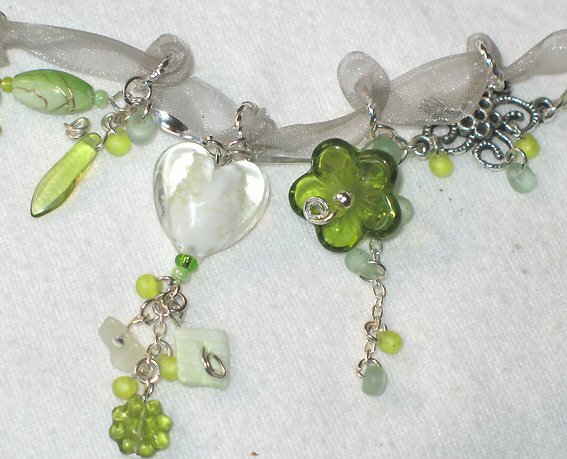 I wanted just the right beads to hang from them and when I finally found them, I made two very different bracelets. The first one uses teeny light siam Swarovski flowers and Swarovski bicones in light siam and ruby. 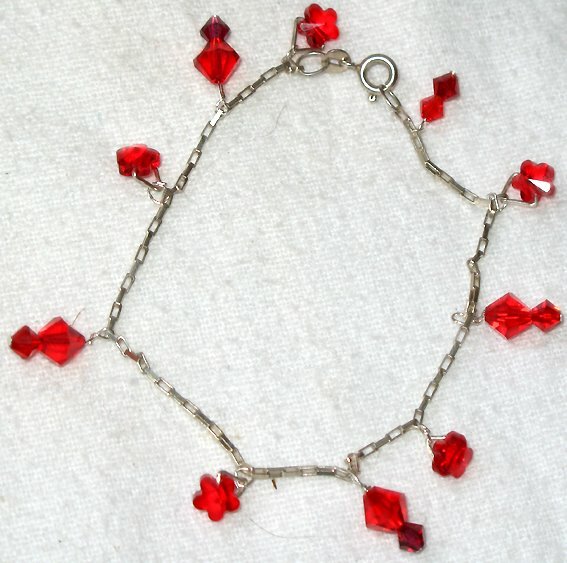 It sparkles in the light and is so pretty and delicate. The perfect Christmas present. The second one uses teeny rose quartz stars with light amethyst and rose alabaster Swarovski bicones. 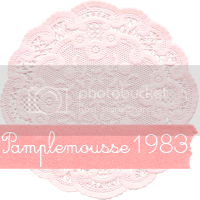 I love this one, it is very special and very delicate. I recently bought some lovely deep blue shells which I've used to make lovely braclets and earrings, however I wanted to use them in a different way and make something really special and unusual. The necklace below uses shells in different shades: pale teal blue, grey, purple and deep blue. 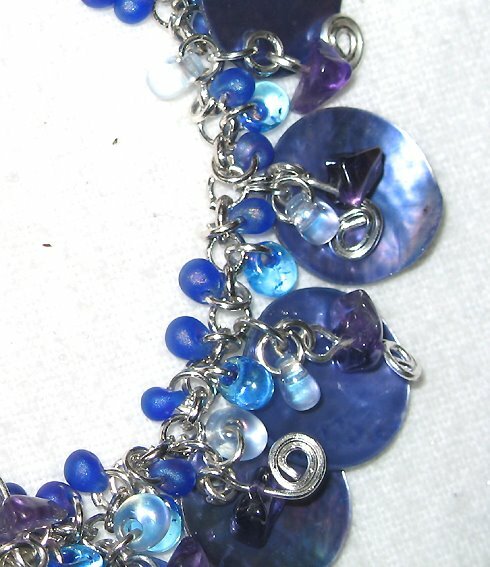 I've also used vintage beads in blue and purple and many semi-precious gemstones and chips, and of course Swarovski beads to really make it sparkle. I've used fluorite, jade in different shades, lace agate, amethyst, purple agate, rose quartz, lapis and plum coloured stone. 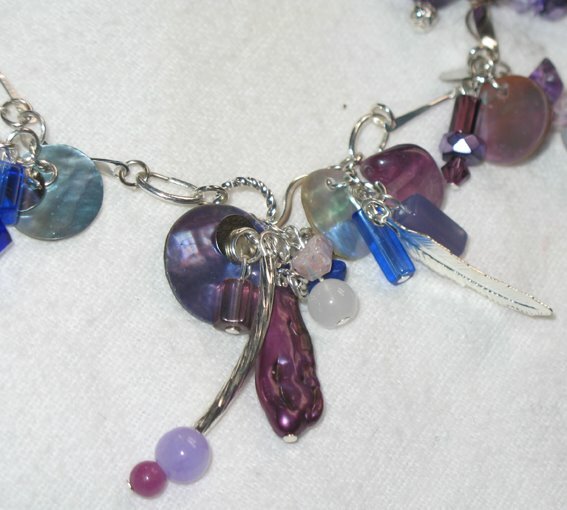 Rather than threading the beads or just sliding them on eye pins and connecting the pins, I've created little "bunches" of beads and shells which I connected together using either an oval or twisted round jump ring. I then connected the bunches using connectors - swirly, twisted and straight. 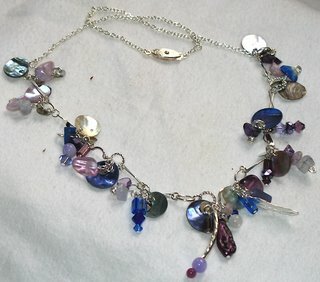 All the findings are a bright silver which works very well with the blues and purples. The centre piece is a blistered deep puple shell pendant and I've also added a feather charm and a curved silver plated tube to add more interest to the necklace. The close-up shows how intricate the necklace is and the beauty of each and everyone of the beads/shells/gemstones I selected. I am really pleased with the necklace and think it's one of the most special and unusual I've made. I went on holiday this year to Nice and my friend Alison handed me a large bag of sea glass. I still haven't attempted to drill holes into the lovely sea glass because I am afraid it will split and break, however, there are other ways to "skin a cat". 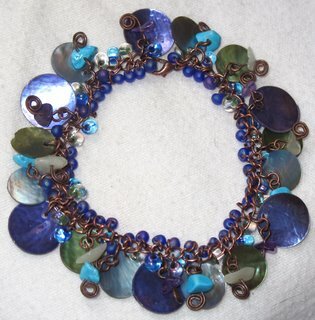 Below is my latest attempt to "deal" with the sea glass and turn it into a beautiful piece of jewellery. 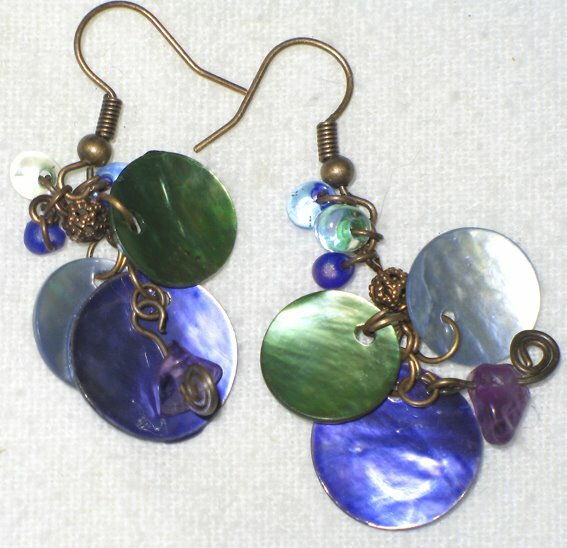 I've used spiral cages and encased small bits of sea glass in each. I've then added vintage beads (and a few modern seedbeads) which I enhanced by using silver plated bead caps and spacers, all strung from a silver plated thin chain. Can you tell? I love black. Here's another one. 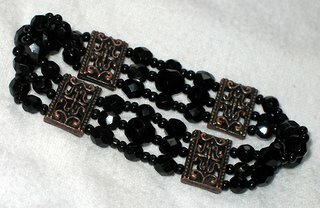 This uses new and vintage beads (the same black faceted vintage beads as in Blackberry in the previous post). When I began the design, I started with some new spiral beads. They had a lovely smooth but matt texture with the actual spiral picked out in a glossy line (see below for the close-up shot). This use of two different textures in one bead gave me the idea for the design. I wanted to use more different textured black beads, so I found: the faceted jet black beads, smooth, shiny black squares, charcoal rough textured Japanese seed beads, small black diamond Czech beads, slick hematite hearts and glistening black leaf shaped drops. I them realised that I had opposites in the shapes as well - round and square, soft and faceted, simple and elaborate, which gave the necklace its name: Yin and Yang. 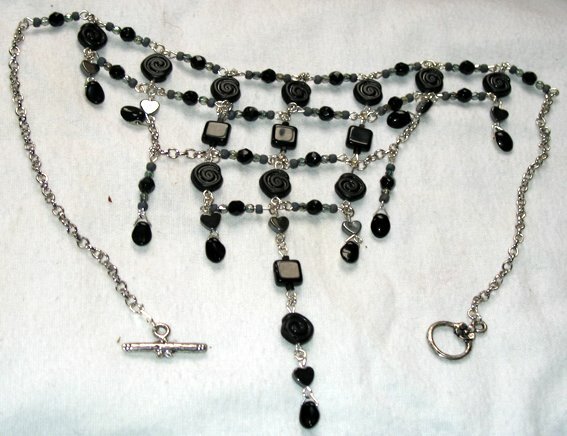 Below is the whole necklace laid out so the "net" structure is clearly shown. 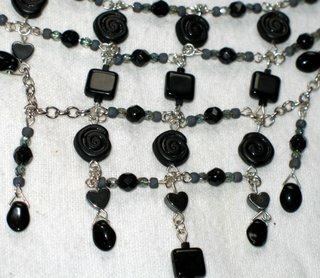 Below is a close-up shot which shows the different shapes and textures of the necklace. 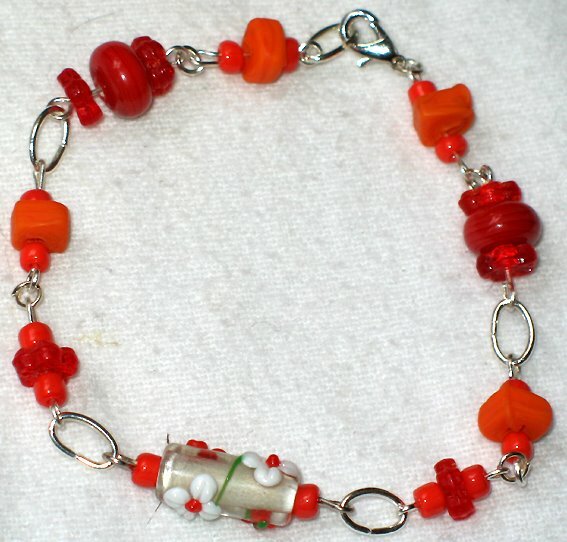 This week I've been indulging my love of vintage beads. 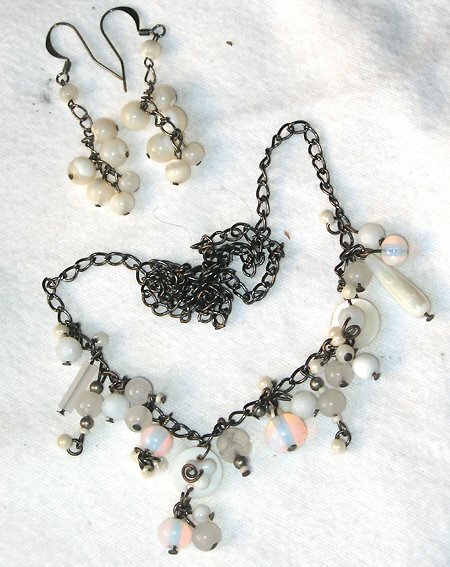 I wanted to make one set purely with vintage beads. A while back I bought three jet black faceted necklaces. None of the three was in very good repair and they all would have had to be restrung. 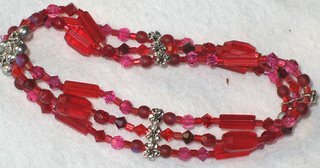 With a little help of my son I broke them apart and have used a few here and there, but this week I finally made a set just with those beads. I've used the black beads (different sizes) and the seed beads that had formed part of one of the original necklaces and antiqued (but modern) copper findings - bead caps, chain, spacers, etc. 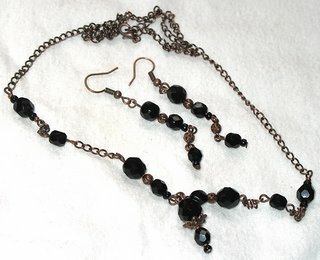 Below is the necklace and the earrings. 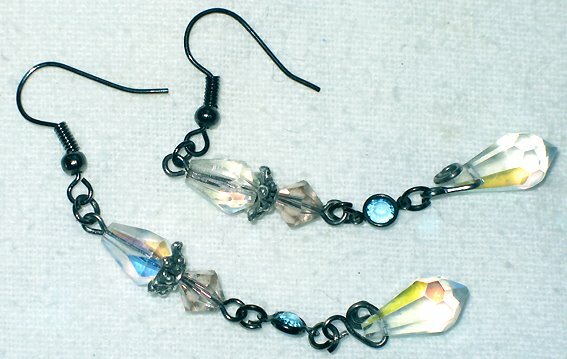 Both are fairly simple, unfortunately I didn't manage to quite capture the beautiful faceted shimmer of the beads. Below are the earrings and the centre of the necklace in more detail. Apparently, flapper necklaces are back in fashion, or so I was told. So I had some fun. :-) Did these two today. 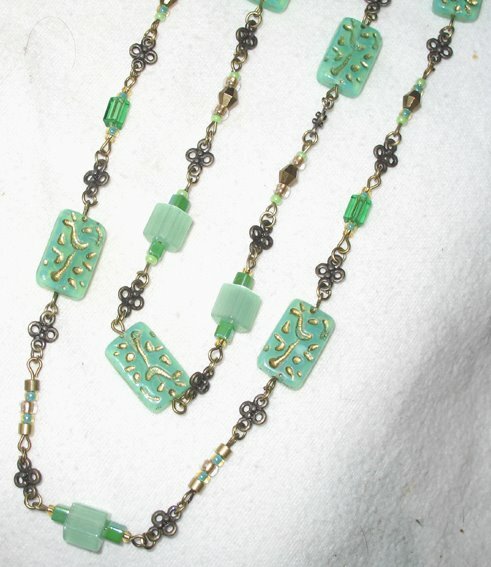 They are both quite long (the teal necklace is a bit longer though) and they hang beautifully. The jade and gold necklace shimmers lovely and it's unusal with the gorgeous jade and gold rectangle beads. I added quite a few vintage beads and some connectors to make it interesting. I've tried it out on different coloured t-shirts and it works perfectly with cream, black, different shades of green, dark brown, chocolate brown, maroon and purple. All this season's colours. 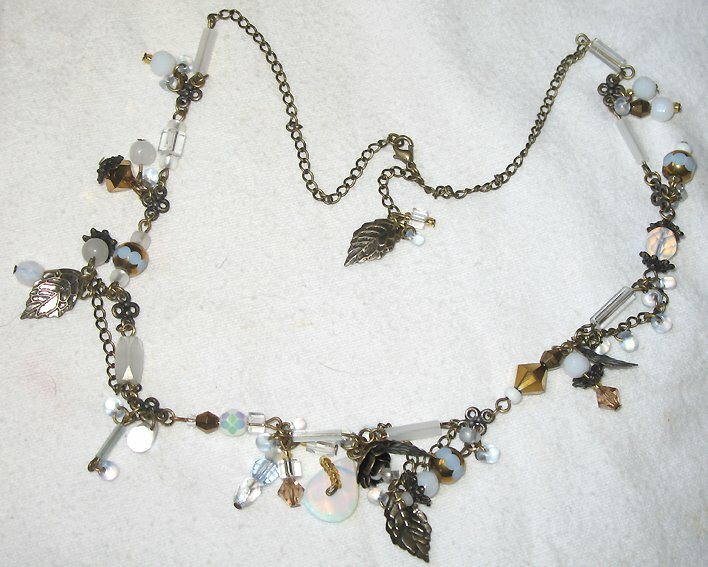 Here's the necklace in more detail. 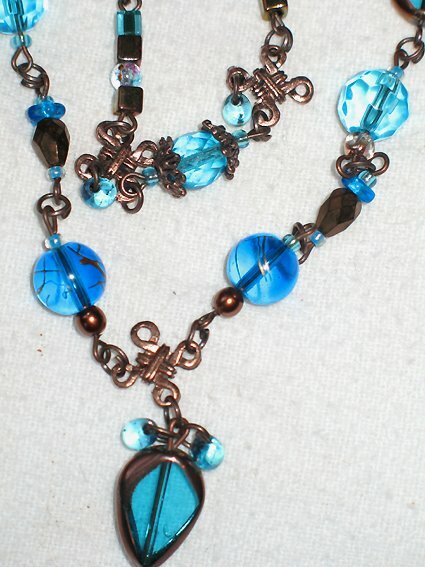 The teal necklace was made with copper findings and the large drop shaped beads have come all the way from China. 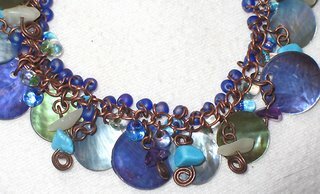 They are framed in copper and look stunning all by themselves, but for such a long necklace I wanted to make it more interesting so I added more beads, including some beautiful vintage beads. Couldn't resist the shells so I had another play.... 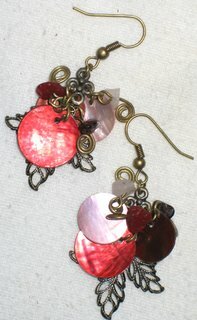 This time I used the red shells, some smaller soft pink ones, and also some deep copper shells. 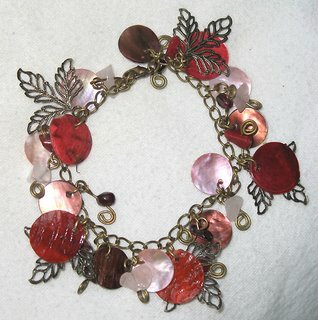 I added some rose quartz, garnet, and red candy jade chips and the beautiful filigree leaves. No Magatma drops this time. It looked so elegant and light that I didn't want to add any weight. These are seriously fun to make. A bit fiddly maybe, but fun. 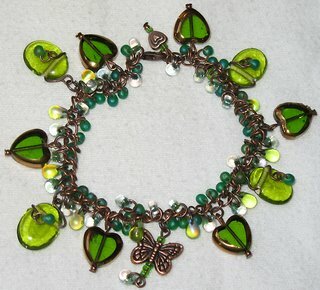 I've finally got myself some coloured jewellery wire and used the green one for this butterfly. 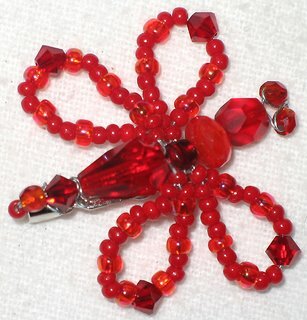 The brooch and therefore the butterfly is slightly larger than the previous two. I've used beautiful Swarovski beads for this butterfly (2 per wing, one on the tail, and 2 for the eyes) and also some Giverney and lustred beads and, of course, great quality seadbeads. 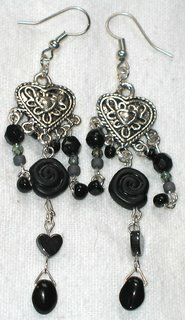 Here are the earrings I made. Here's the next pair, these are to go with the Winter Sea bracelet I posted a couple of days ago. 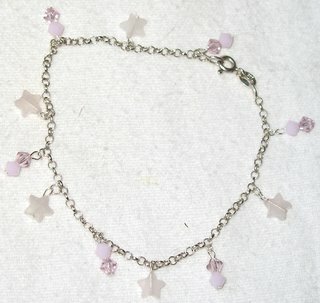 Here's a brandnew, hot of the press bracelet. I've made with the blue shells and slightly smaller shells in green and teal blue. I then added little dangles with amethyst, new jade and turquoise chips and Magatama drops in pale seagreen, turquoise and cobalt blue. I love the organic effect and to me it has a feel of the sea in Winter about it. I just love greens and blues together. I got myself a lovely new wrap top. It's a beautiful maroon colour, however, it's rather revealing and I decided to make myself a matching brooch. 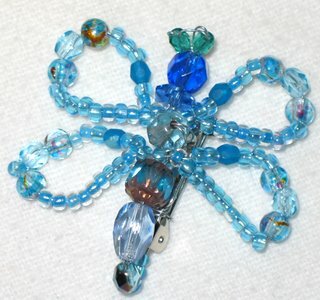 This blue butterfly is for sale. The red one is MINE. 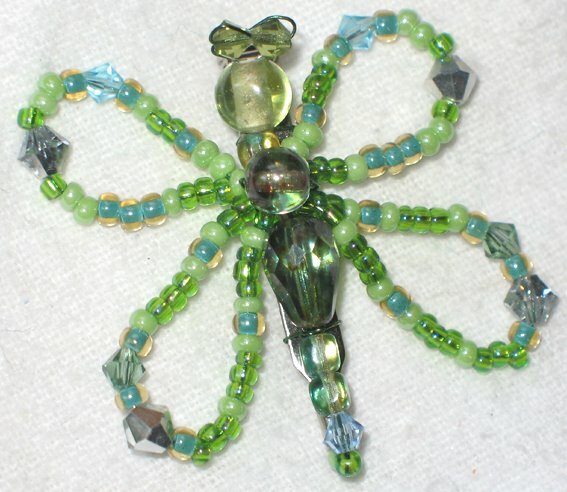 :-) However, if you want the blue one (or a green, or purple, or pink or any other colour butterfly, contact me. I've been busy today with the new blue shells I bought recently and some Magatama drops which arrived today. The bracelet below is made with the blue shells, amethyst chips that have been threaded onto silver plated headpins and curled at the ends to create little spirals. (Thanks for that tip Rache!) 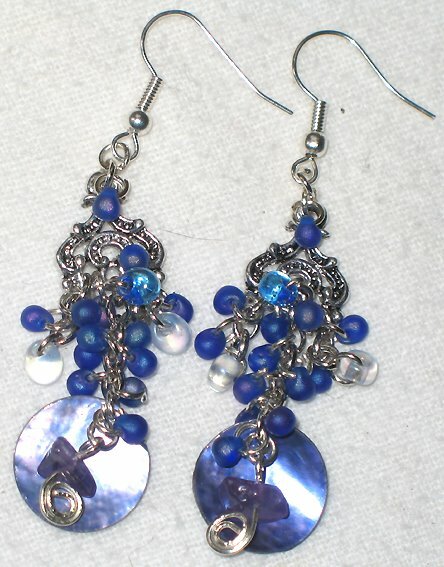 I then added little Magatama drops in different shades of blues and different sizes to fill the spaces and to add texture. I love the effect! 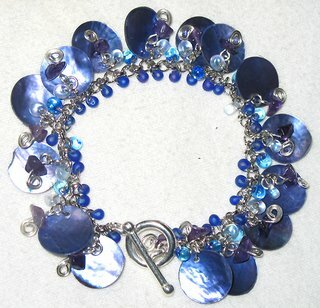 The blues work really well together and create a deep soft blue with purple and teal highlights. 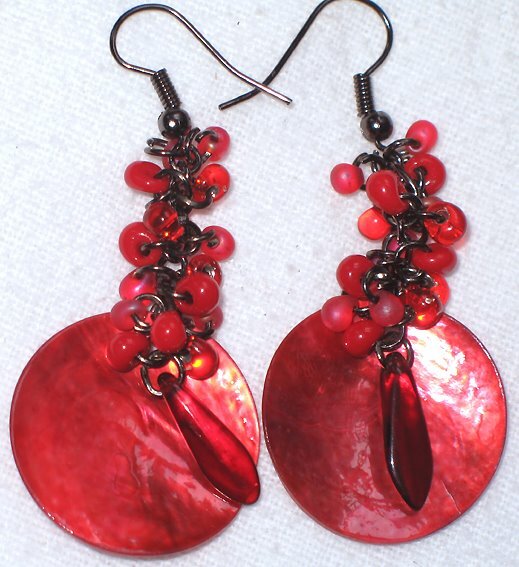 I did some stunning red ones, too, to match the red shell bracelet from a previous post with slightly larger drop shaped shells, but have mislaid them and can't find them anywhere. :-( However, they'll turn up again and I'll display them here when I've found them again.